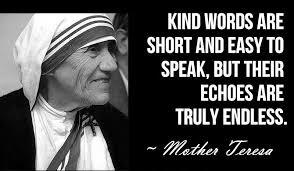 Mother Teresa once said, “Kind words can be short and easy to speak, but their echoes are truly endless.” How true! A few simple words, spoken by unassuming people, yet filled with the Lord’s Spirit and love, can reverberate throughout the lives of those they are spoken to in tangible and powerful ways. There are so many situations where, if we stop to think about it, we can be sharing simple, kind words that will add up to having a substantial impact on others. It helps to think ahead a bit. What could you say in scenarios like these that you will probably encounter: To a friend who is going through a rough patch? To a child? To your boss? To a teacher? To someone with a beautiful smile? To an elderly woman who has aged gracefully? To the night watchman? To the gardener? To the street sweeper? To the clerk in the store? So much can happen through a few caring words. A woman who worked for a major airline noticed a young man half her age in the hallway and in the lounge from time to time. He looked unkempt and always reeked of cigarettes. One day when taking a break she saw him standing near the door. “Why are you smoking?” Her tone wasn’t harsh, just curious. She nodded. That was the end of their conversation. She continued to encounter him occasionally over the next several months, at which time she would ask him if he had made any progress in quitting the habit, and expressed her concern for him. She always ended her conversation with “I care about you.” One day she again asked Greg, the young man, how things were going. Another story that I heard some years ago, which left a deep impression on me, is about a marriage that was on the brink of ruin. The husband had lost his job and soon became moody, sarcastic, and mean. The wife wasn't the support that she should have been. She didn’t realize how devastating the loss of employment can be to a man’s self-esteem, not to mention the intense burden of financial responsibility that most men feel for their families. The frustration and the resentment and frayed nerves grew. Things got so bad, it looked like divorce was inevitable. He started drinking and staying out late at night, spending the little money they had left. Tears were streaming down his face. She started crying too, as they held each other, expressing their love and asking for forgiveness. Those four little words saved their marriage and … her husband. He had been on his way out the door to end his life. And here’s one more testimony by a man named Richard North that illustrates how a little comment made a huge difference in someone’s life—and in fact, in many other lives as well. I was a thirty-five-year-old schoolteacher, and I’d been teaching for almost ten years. But here I was, contemplating quitting and beginning the search for a new profession. The idealistic fires of inspiration that I’d begun with had gradually died down, until lately more often than not I found myself wondering why I had ever chosen the teaching profession. I felt like I had given this job the best shot I could, but it just wasn’t worth it: the kids were belligerent and thoughtless, and the parents were too often angry and irritable. I felt that the years I’d spent teaching had been a waste. I had begun to wonder if anyone appreciated all that it had cost me. Ten years of my life invested, and it seemed as if I had nothing to show for it. My transformation came about because of an assistant teacher who came to my classroom to help out and get some hands-on training. He had only been in my classroom for a couple of days when, as I happened to enter the teachers’ lunch room during lunch break, I overheard him talking to a couple of other assistant teachers. What impresses me is that the words we say—which can seem so matter-of-fact, so common, so meager, so insignificant, and often awkward—can, in fact, be invaluable and of great consequence to the person to whom—or about whom—we say them. What to us may seem like hardly anything can be like food to a starving soul, or water to a man dying of thirst. What costs us so little to give and seems so small in the bigger scheme of things can mean everything to someone else. Originally published September 2012. Adapted and republished September 2016. 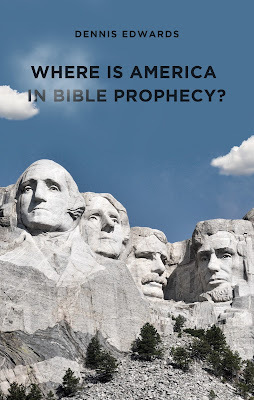 1 Condensed from The Esther Effect by Dianna Booher (Nashville: Thomas Nelson, 2001).